Electrolysis works for all women, men and gender diverse clients on all parts of the body. Because it requires specific attention to each hair follicle directly, it is proven effective regardless of skin pigment, hair color or density. This approach allows you to have a tan while receiving electrolysis treatments. It is also perfect for treating stubborn hair that sticks around after other methods were unsuccessful and those sparse light hairs. Our hair is constantly changing from a number of factors that make us who we are, it’s in our DNA. It is this diversity that makes proper hair removal through electrolysis a process. As our body reacts to different situations such as hormones, medications, weight and even our genes, our hair growth pattern changes and may activate dormant hair follicles. The complex nature of hair growth controls the number of sessions required to reach your personal preference of hair removal. Generally, electrolysis results are noticeable within 3 months and can take 12 -18 months for completion. We offer sessions from 5 minutes to several hours and will recommend a schedule fit for you so we can treat the follicle right when it emerges and at its optimal time for reaction. 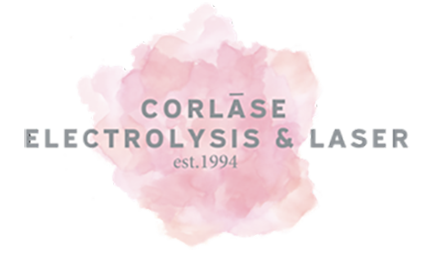 Corlase Electrolysis & Laser’s goal is to see this process though to ensure complete satisfaction. Each individual has a different tolerance level, and that is taken into consideration by the electrolygist. Modern electrolysis methods can be described as causing a tingling or warming sensation, but is considered to be comfortably tolerable. Topical desensitizing creams can be applied to help ease the sensation. After your treatment, it is common to experience redness or swelling, both of which are usually short lived. These are both natural reactions from the stimulus applied the follicle and can be eased with the use of an ice pack and witch hazel. In order to prevent any additional reaction, it is critical that you inform us of any medical conditions, medications, supplements, lotions and oils. If done properly, side effects such as redness and swelling will dissipate within 20 minutes to a couple of hours. Some people with sensitive skin may have a little longer healing. At the bare minimum, if electrolysis is performed improperly you can expect partial or full hair regrowth. Poorly performed electrolysis can cause lasting skin damage and can also spread infections. Remember that electrolysis hair removal is essentially an invasive process designed to obliterate hair follicles. That’s why it important that you’re in good hands. You may also call Dana or Andrea with questions at 919-460-1884. Tell us a little bit more what are you looking for and we’ll provide you with some direction.